There's nothing like a real threat to promote the idea that the threat exists everywhere. Consider that two days after the backpack bomb was found on Martin Luther King Day an abandoned piece of luggage kicked off the same police response. Roads were blocked, traffic was rerouted, and a lot of police resources were expended--for a clothing-filled suitcase. I question whether it's always better to err on the side of caution. Here's a difference between the backpack bomb and the clothing filled suitcase. Just like you or I probably would, the men who found the backpack examined it. In our society, if you find someone's personal property you most likely want to find out who it belongs to so you can return it to them. You look inside to see if there are any clues that would lead you to the owner. If you don't find any then you probably turn it in somewhere or keep it and put an ad in the paper or online to help locate the owner. The three men examined the backpack and correctly decided they should call the police. [Brandon] Klaus said that when [Mark] Steiner first found the bag the three of them set it on a bench and spent probably two minutes or less examining it before they decided it was potentially dangerous and police should be called. Exactly, but what they found was definitely worth reporting. 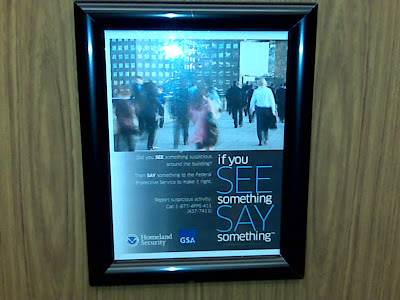 What are the odds that whatever you see or find contains a bomb? Pretty darn slim. Had someone looked at that suitcase they could have made a simple determination without resulting in an unnecessary police response. I see people in the downtown area carrying backpacks and/or pulling a suitcase all the time. They're quite likely homeless. Sometimes they can be frightening but they're definitely not terrorists. Three years ago the New York Times published an article about the Metropolitan Transit Authority "If you see something, say something" campaign designed to combat terrorism much like the Homeland Security one displayed above. Out of the many thousands of calls, none had resulted in a terrorism-related arrest. If you ask amateurs to act as front-line security personnel, you shouldn't be surprised when you get amateur security. We need to do two things. The first is to stop urging people to report their fears. People have always come forward to tell the police when they see something genuinely suspicious, and should continue to do so. But encouraging people to raise an alarm every time they're spooked only squanders our security resources and makes no one safer. When I hear people discuss this, there's always that one person who pipes up with, "But what if it really was a bomb?" Suddenly the group agrees that it's always better to be safe than sorry, forgetting they were safe in the first place. Go figure.